Apple Park is a technologically innovative, climate responsive 21st century campus. This new development provides a serene environment reflecting Apple’s brand values of innovation, ease of use and beauty. The project replaces the disjointed assemblage of aging corporate facilities that previously existed on the site, with a single high performance office, research and development building, with supporting facilities. The buildings are located in a unified and secure landscape, which extends and connects the interior workplaces to outdoor facilities for recreation, relaxation, and reflection. The entire campus, indoors and out, is intended to promote shared creativity and collaboration, and spur invention for generations of Apple products to come. 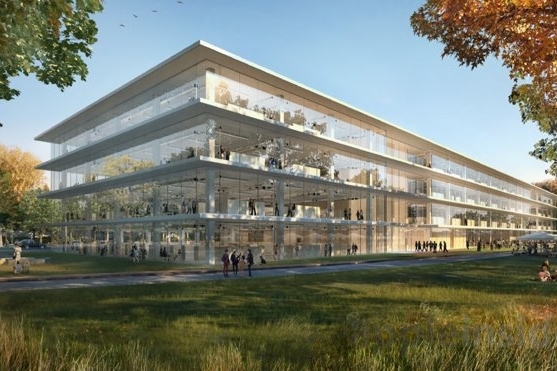 Film of the new Apple Park in Cupertino, 175 acres of rolling parkland and one of the most climate responsive buildings in the world, February 2017.